Replacing a missing tooth with a dental implant is the most successful treatment modern dentistry can offer. The missing tooth can be replaced without damage to the adjacent teeth and is a fixed restoration rather than a removable appliance. The dental implant looks, feels and functions like a natural tooth. It restores your confidence to smile, chew and speak just like before your tooth was removed. An implant can likewise replace multiple teeth, or be used to stabilise a denture to make it a firm, well-fitting appliance. What makes a dental implant different? A dental implant consists of two parts. There is a titanium screw which is fixed into the bone and a crown, which is screwed into or cemented onto the screw. Whilst this sounds somewhat dramatic, the screw itself is quite easy to place under local anaesthetic, intravenous sedation, or general anaesthetic to ensure your comfort. The implanted screw is then given time to for the bone to fuse to it before the final crown restoration is done. The final restoration looks just like a natural tooth made of porcelain fused to metal or Zirconia and attached to the titanium screw. This natural appearance can assist patient confidence and comfort. The titanium screw placed within the bone assists us not only to place a great restoration, it also helps retain bone. When a tooth is extracted, the bone is no longer required to hold the tooth in place, so it diminishes in height. The titanium screw can assist the bone remain at its former height which improves facial appearance, reduces damage to the bone to adjacent teeth, and assists with retaining opposing teeth. What happens next with Dental Implants? The Dentist will discuss with you in detail the pros and cons of an implant for your mouth. An assessment of the viability of an implant for you may be undertaken to determine if there is enough bone existing currently to support an implant. A thorough treatment plan will be provided to you and timelines discussed. Dental implants are highly successful, with latest figures showing their success rate is around 95-97%. This makes implants one of the most highly successful treatments in modern dentistry. We are proud to be able to offer such quality dental care to our patients. Need more information? View our FAQ’s, call us on (08) 8212 3880 or Contact us for a free brochure on implants. How much does a single dental implant cost? A single dental implant is performed over two treatment phases. The first phase of treatment involves removal of the tooth, and placement of the Titanium screw into the bone. This phase of treatment will often cost between $1500 and $3000, depending on the type of extraction, the type of sedation the patient chooses and any further work required. The second phase of treatment involves making and fitting the final crown of the implant. This is usually a Titanium and Porcelain combination, or a Titanium and Zirconia combination. This is a very strong, long lasting material combination. It is custom made by our technicians to fit the screw within the bone, this is a precision attachment and will cost between $1800 and $2500. How much does it cost to get a full mouth of dental implants? A full mouth of dental implants is rarely necessary. New techniques allow us to construct a wonderful mouth restoration based usually on 4 dental implants. This is certainly a complex restoration and rehabilitation of the mouth. This treatment would need to be fully treatment planned with a Dentist and possibly a Prosthodontist- dental rehabilitation specialist. This treatment would be in the tens of thousands of dollars. It may take a few days only to settle following tooth removal and implant placement. Gentle care of the site is important for the easiest and quickest healing. The discomfort is usually very minimal, just a little bruised feeling. Following healing, the rest of the process is quite painless. A local anesthetic will be used to ensure comfort when the Dentist is working. After completion of the restoration, a dental implant is surprisingly natural feeling and not painful. What to expect when getting dental implants? If you require dental implants, expect the process to take several months. The tooth is extracted and the implant placed in the first stage. Sometimes however, the implant won’t be placed at the same time as the tooth is extracted to ensure the bone heals well. Keeping healthy bone around an implant is essential. The implant won’t be fully completed until the screw is integrated with the bone it has been placed into. This takes time-around 4 months to heal fully. An implant will need to be cared for very gently, but thoroughly to ensure its longevity. You will need to floss around them and brush carefully as well as have it routinely checked. Implants can occasionally require tightening the top screw and some require dental cleaning. They are not maintenance free. 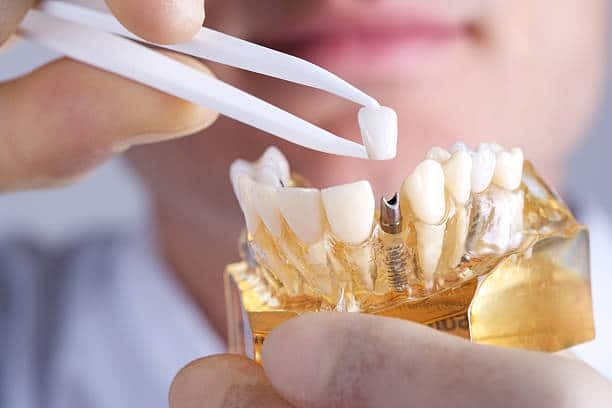 An implant is however, the best replacement option for replacing a tooth in many instances and will provide you with a natural tooth look and feel. Dental implants are precision made attachments and made from very hard-wearing materials. The implant if well cared for can last over 40 years. Can you pay monthly for dental implants? Our Practice Manager and Dentist can draw up a suitable payment plan should it be necessary. The negative effects of dental implants can be they occasionally fail. An implant is not infallible and must be well cared for, precisely placed and the patient’s bone must integrate fully with the implant screw for it to be successful. The Porcelain or Zirconia crown may sometimes chip and need replacement. They are generally a wonderful addition to the mouth. How long does it take to heal after dental implants? After tooth extraction and implant screw placement, it is advisable to be gentle with the area for a couple of days to a week. This allows the tissue to heal happily and comfortably. The bone takes around 4 months to fully integrate the screw. The final phases of treatment do not require healing time generally. What can I eat after an implant? You can eat anything you would normally eat with natural teeth. An implant is not to be “tested” on things you would not normally, comfortably eat. They can fracture just like a normal tooth. Straight after an implant is placed in bone, you may want to avoid that area with food for a couple of days to allow it to heal well. Can I drink coffee after dental implant surgery? You can drink coffee or any other beverage after dental implant surgery. It is a good idea to avoid alcohol to give the body time to heal. It is also important to follow the exact instructions of your Dentist as your instructions for care may be different. It is also best to allow the numbness to wear off before having a hot drink-you may burn yourself quite badly. Local high quality technicians with premium materials to create long lasting results. We will assist you with the sensitivity that can occur and how to maintain the bleached result. Our hygienist is best placed to assist you to keep your teeth clean and gums healthy. Our Dentists will provide comprehensive examination and treatment planning. Your child’s first visit to the dentist is very important and will assist in their care for life. Replacing a missing tooth is easy with a dental implant and will blend in with your other teeth due to it’s natural look. Dental crowns are the preferred treatment when there is little left of the tooth or been weakened and needs support. We proudly supply all types of dentures for patients including full dentures, partial, relines and denture repairs.